Saramonic, a respected leader in audio gear, has appointed MAC Group as their distributor for business in the United States. As people develop their skills, they need higher quality and more versatile and specialized tools to pursue their passions. Adding audio gear to our broad range of products serving filmmakers, content creators and photographers is a no-brainer for us. 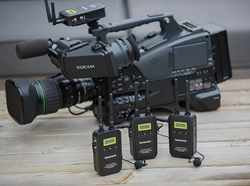 A critical focus within the rapidly expanding video segment at MAC Group is providing the right gear and support for single person and smaller crews. This focus naturally extends to the audio category and Saramonic. Saramonic is known for innovation, quality and value, with a broad range of products including audio adaptors for DSLR cameras and camcorders, special purpose microphones, lavalier microphones and accessories as well as Smartphone Audio equipment for use with mobile devices, tablets and GoPros. MAC Group has expanded its brand management, sales and marketing teams to support Saramonic and its dealer base including specialty audio and music retailers in addition to their current photo and video channels. Saramonic is a professional sound equipment solution company which focuses on producing audio adapters, microphones, portable recorders based in Shenzhen China. MAC Group is a sales and marketing company dedicated to supplying photographers, videographers, educators and students with the world's finest image-making tools, support and inspiration.